Cake smash tradition came to us from United States. 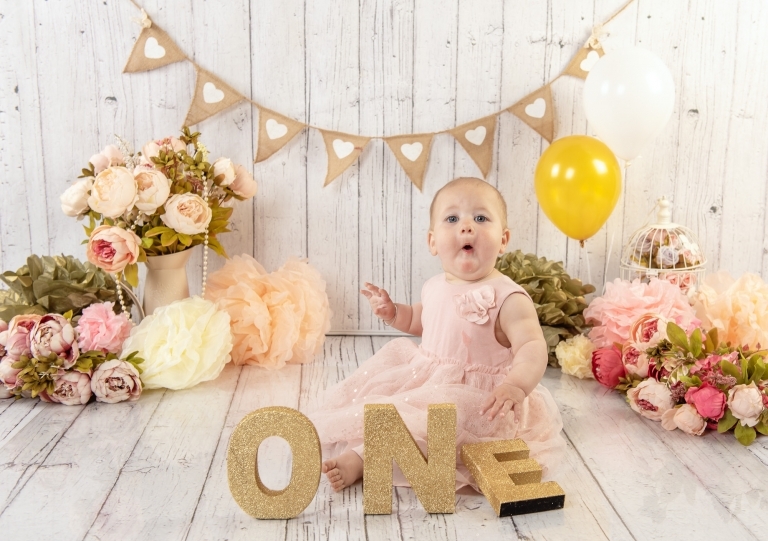 At age of one year old, little ones have unpredictable reactions when they touch and interact with things. With cake being the one they touch and play with it like children of older ages never will. So capturing these precious expressions are quite important and those images become amazing keepsake for the years to come. In the latest fashion cake smashes have grown to become “Smash and Splash” sessions and now include the bath time after the messy play, followed by cute photos in the towel. 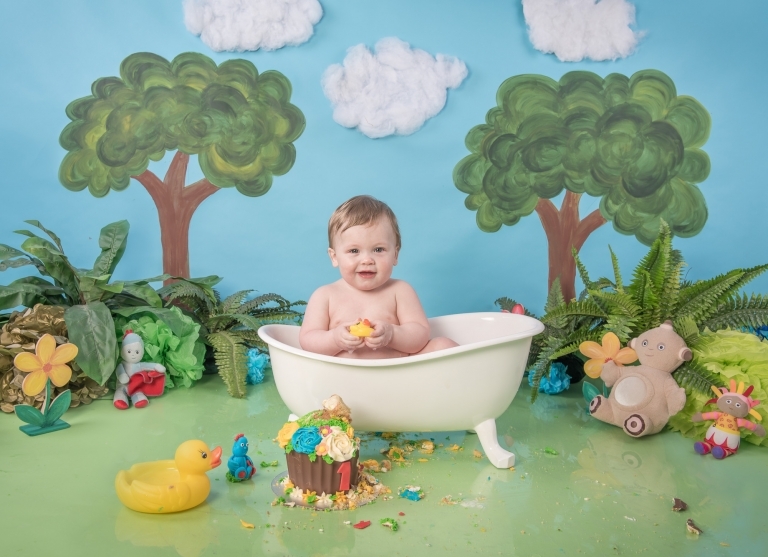 Babies usually love splashing in our beautiful Victorian style bathtub, so we capture lots of gorgeous moments. 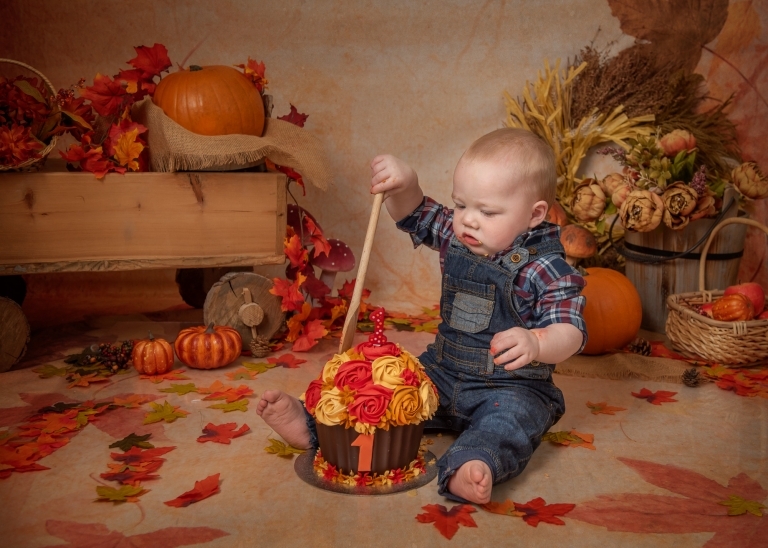 Cake Smash is a wonderful way to create beautiful fun memories of your baby. Usually it takes place at our photo studio in St Austell. The cake smash session starts with pre-smash photos. They can be photos with siblings or parents if needed. Then we progress to the baby eating and interacting with the cake. And finally Splash, when the baby enjoys the bath and cosy time wrapped in the towel. All parts of the session are dependant on your baby’s mood on the day. There is no guarantee with anything. However we will do our best to capture some beautiful moments to treasure for years to come. Unfortunately we cannot provide gluten/dairy/egg free cakes at this stage. 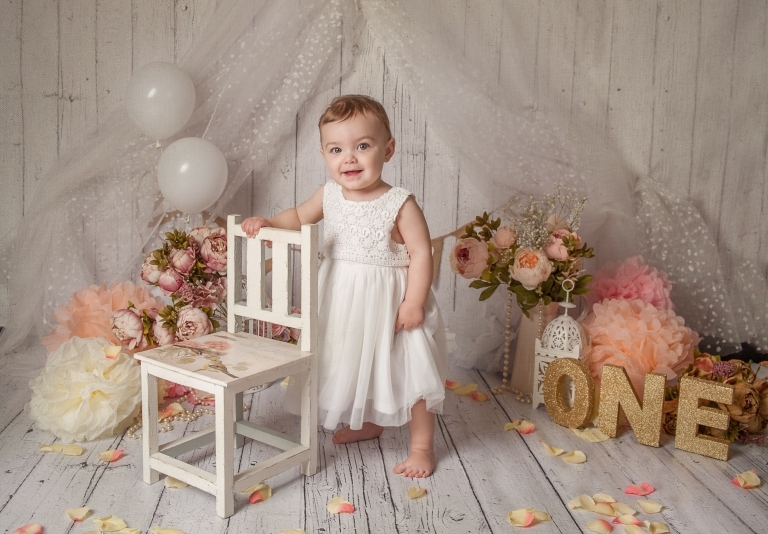 After the session we schedule the date (usually after 7-10 days) for you to be invited to the studio to view your edited images in person, that’s when you may decide which package you’d like to purchase. We have 12 ready made themes to choose from. However if you like a theme which is not on a list, please let us know and we will get it designed for you! Because we need to order the cake, arrange outfit and props beforehand, there is £65 non-refundable session fee payable at the time of the booking. There is no extra charge for twin cake smashes if they share one cake. However you can choose additional twin cake option upon check out should you wish to add one. Q: My child is allergic, can you providedairy/gluten, egg/sugar free cake? A: At this stage we are unable to procide special dietary requirements cakes. Q: What happens if my baby doesn’t want to smash the cake? A: All children are different. Some love to play with the cake while the others barely want to touch it. We work around it and usually manage to get some nice shots in spite of it. It helps if parents interact with the child during the session, sing his/her favourite songs and encourage them. Q: Can we have family and siblings photos with the baby during the cake smash session? A: Before the cake smash we can take some family and sibling shots as well as baby on his own ones. Because cake smash photo session is full of activity (smashing, splashing, playing ont he towel), babies often are getting tired by the end of it so family shots are not always possible in the end of the session. "Had a great time at Callum's cake smash, it was so much fun. Can't wait to see the pictures. Highly recommend!"